I've been looking for a good recipe to accompany my coworker's BBQ Chicken Chili and I think I finally found it! Check out my amazing corn bread recipe! Mom always made bread from scratch. It was very rare when we had store-bought bread in the house. This was great since she would mix up the recipes with different herbs and other ingredients. I, however, had never made bread of any kind from scratch. Until now that is. I'm so excited this corn bread turned out so well! I had to call Mom and tell her about it. Speaking of corn, did you know that most of the corn you see in the fields isn't for human consumption? Less than a percent or two is sweet corn. The rest is corn for livestock and other uses, such as ethanol. There's more uses for corn, but those are two big ones. It's planting time right now, so you may have noticed more tractors and planters in the fields and on the roads. Since I can't ride along with my brother during planting (2,000 miles makes that a bit difficult), I'm lucky to have friends and adopted family that let me help and ride along. I'd never really experienced planting until last spring and was excited to learn more. Before you take the planter out to the field, you need to fill it with seed. There are so many different varieties from various companies. Some is to grow seed corn, others for silage corn, others for corn to shell. Lots of options. Then, you add some seed lubricant on top. Seed lubricant protects the meters on the planter and helps seed flow better through it. It's black and Jason said to be careful with it and not get it all over me. It was a little windy and I wasn't as careful, my hands ended up black and it ended up on my face, arms, and basically all over me. Oh well, it's part of the fun. The tractor has a lot of sensors inside it that will go off when something isn't right. The planter may not be working properly, may be running low on seed or something may be dragging. When something isn't working properly, you get out and fix it. These measuring sticks are used to determine how far down into the soil the seed is planted. Seed can be planted closer to the surface when it's going to rain in the near future since the rain will push the seed deeper into the ground and help the roots. It's a much smoother ride during the planting part of it than when using the field cultivator. 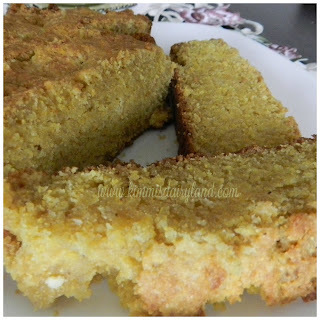 Now that we've talked about how the corn gets into the ground, let's get back to this delicious cornbread recipe!